Beyond Bedding was gracious enough to send us a bedding set of our choice to review. 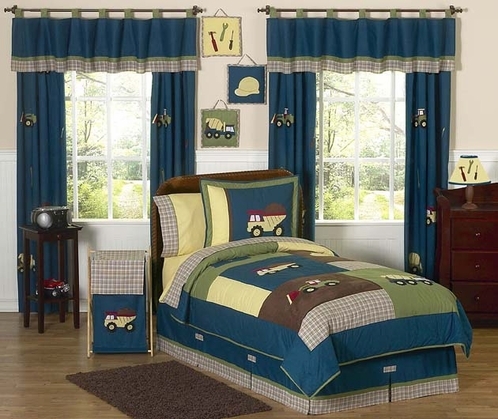 From their large selection of kids bedding sets, we chose the Construction Zone boys bedding by Sweet JoJo Designs. I specifically got the bedding for my best friend who recently had a house fire. They lost nearly everything. Her son adores trucks and this was perfect for him. 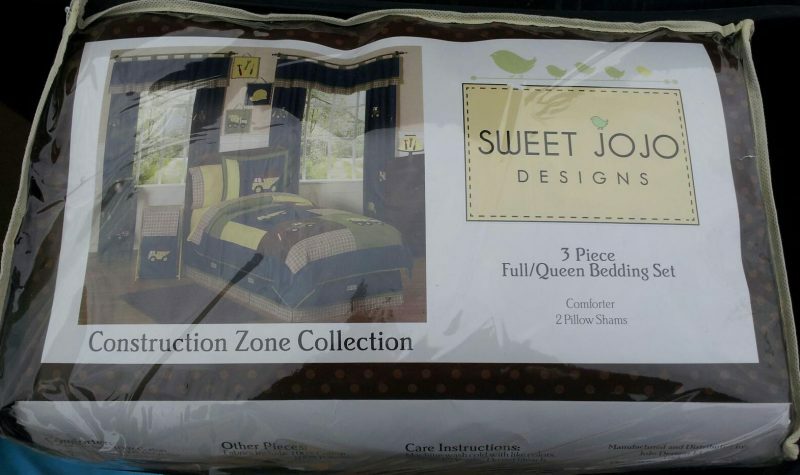 The construction zone queen bedding set comes with the comforter and 2 standard shams. We also received the bedding skirt to match. It really makes the whole set come together. Very cute! The comforter is made of 100% Cotton and Microsuede with the cutest patchwork design. It has a color combination of blue, grown, brown and yellow. The applique and embroidery is very high quality and features trucks, tractors, hard hats and hand tools. I also like how Beyond Bedding offers custom baby, toddler and children’s bedding with accessories to match. You can even make your own crib bedding! You just choose your fabric, bedding size, bedding style and customize each piece. Enter to win 1 of 10 children’s bedding sets in our Beyond Bedding Giveaway! My son has this bedding. I love it. The quality is great, and it has held up really well to all of the washing it’s had to go through. They have great products. My daughter is waiting on a set from Beyond Bedding. That was so sweet of you to help a friend. Great bedding and a great review! Thanks for all u do! I love this set for a little boy. It’s so cute. I especially like that it has the coordinating drapes. They just make the room look more complete. what a cute bedding set. They have such cute bedding. Thanks for the review. I love seeing the sets all put together and made into a magazine looking picture! Although I have no children at home anymore, their still great to look at and give my daughter ideas for my grandchildren! This bedding is so super adorable!!! I love it and I want to get it for my youngest when he outgrows his crib! What a cute bedroom set. Seems pretty flexible from early age thru grade school. So it’ll get its use well. FYI – I live in Gladstone! Thanks for the another great place to shop for great products. Really like the bedding sets they have. GREAT!!! I am in love with this set! My son would freak if he came home and seen it in his room! What a great thing you did by getting it for your friend! Thank you for this review. We are relocating and I am trying to move our youngest child out of my room and into a room with his older brother. I am looking for “special” bedding to make him feel like he wants to be in his room. This has definitely become an option for me now. That’s so cute. When the kids have nice bedding they tend to keep their rooms a bit cleaner. Great designed bedding and a great review! I would like to get this bedding for my son’s room.